Accommodation options in Paris range from luxuriously extravagant hotels with an inflated price tag to match, to the more wallet-friendly that are smaller in size, simpler, noisier - possibly dirtier - and not necessarily in the best area. Alternatively, there are apartments which offer you the authentic, local experience but without the room service, concierge and other perks that come with a hotel stay. 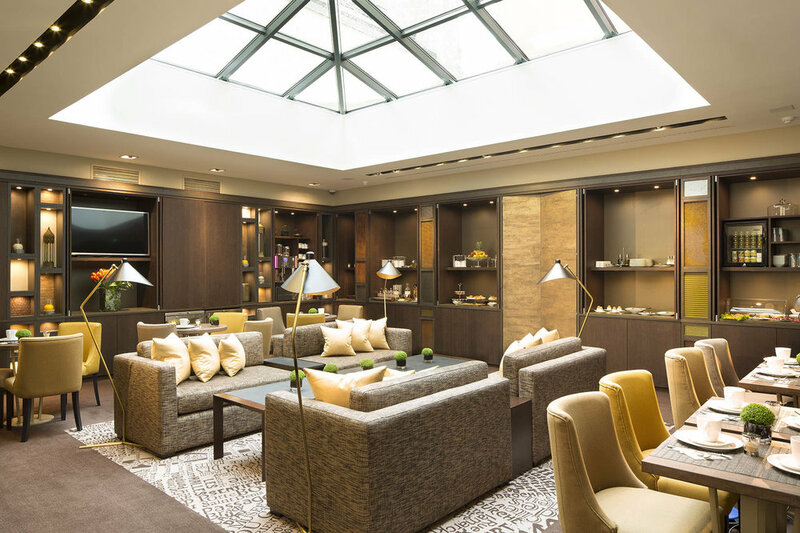 Hotel Villa Saxe Eiffel is a boutique, four star hotel in Saint-Germain that has managed to hit the sweet spot between all three. Discreetly tucked away down a clean, residential laneway within a quieter part of the popular Parisian district, it offers possibly the most peaceful accommodation that I've experienced in my spirit city to date - yet is still only a short stroll to the Eiffel Tower and a realm of traditional fromageries, brasseries and restaurants to be found in the 6th. Everything at Hotel Villa Saxe Eiffel is about understated elegance and comfort. The design is contemporary with warming hues of brown, beige and gold, complemented by soft, calming light. It's not until you've settled into your room or the lounge that you start to see the level of attention to detail that Villa Saxe Eiffel has applied to its design, like beautiful, matt gold light switches, subtle branding cleverly appearing on furnishings, and its own quality amenities range. Our comfortable, warm and extremely quiet deluxe twin-share room looked out to a large, pretty courtyard and down into the lounge area from above. The toilet was separate from a generous, modern bathroom (with a shower over a bath - yes, a bath in Paris! ), making it ideal for sharing. We had plenty of hanging space and a comfortable sofa to rest on, plus a large TV in the centre of the room which could either look over the beds or be spun around to view from the sofa. I found that this created a bit too much of a division in the room but later realised you can lower the screen to open up the space. Other much-appreciated, in-room features includes a Nespresso coffee machine, docking station and speaker for iPhone 5 and 6, complimentary water, robes and slippers (mmm), and a great hairdryer - tick! The shared lounge area, with its lofty glass ceiling, offers a laid back space to grab a tasty buffet breakfast and coffee, do some work using the free WIFI, or enjoy a self-served drink from the honesty bar. You can also relax in the onsite sauna or work up a sweat in the well-equipped fitness centre instead. A lot of thought has gone into this hotel - and continues to do so; a dissonance that can occur in boutique hotels that have invested a great deal into their design and branding but failed to carry the sentiment through to its operations. It's an ideal option for business travellers, light sleepers, lovers of luxury on a modest budget, and those looking for a local touch with a hotel experience. I discovered Hotel Villa Saxe Eiffel through Luxury Escapes; an Australian travel business that connects members with luxury holidays around the world for an exclusive member's price and limited-time offers. This piece is a collaboration between Luxury Escapes, Villa Saxe Eiffel and Little Miss Melbourne to help share the luxe experience with you. All hotel images from Hotel Villa Saxe Eiffel and Little Miss Melbourne.